The interim update from the Gender Pay Gap in Medicine Review has found that the continued dominance of men in senior medical positions is one of the main causes of the gender pay gap in medicine. Today’s update shows that the gender pay gap for doctors is 17% based on their total pay. The overall NHS gender pay gap is 23%. The aim of the review is to identify the impact of cultural, practical and psychological issues that contribute to the gender pay gap in medicine. This is being achieved through in-depth analysis of anonymised pay data, evidence from interviews with medics at various career stages and an online survey of 40,000 doctors. The final report and recommendations is due to be published in September. It is expected to address the underlying causes of the gender pay gap, such as the impact of motherhood and women’s career progression while working irregular hours or part-time. Promoting a culture of respect, equality and diversity will be a central part of the workforce implementation plan, which will be set out later this year as part of the next phase in delivering the NHS Long Term Plan. This week, further steps were taken to make the NHS a more flexible and responsive employer with a fairer system of parental leave agreed for the majority of NHS staff, giving new parents greater choice over how they manage the demands of work and family. The founding principle of the NHS is to treat everyone equally, yet women employed in the health service are still experiencing inequality. It’s disappointing to see that the numbers show that two-thirds of senior medics are men despite more women starting training and it is essential we understand the underlying causes of the gender pay gap if we are to eradicate it from modern workplaces like the NHS. Senior doctors and managers have an important role to play in breaking down barriers and championing equality as role models or mentors so aspiring doctors know they are joining a health service that encourages more women to reach their full potential. 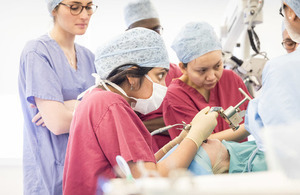 We fully support Dame Jane Dacre and her team as they continue to review the medical pay gap and look forward to their final conclusions later this year. Our research shows that the gender pay gap in medicine is slowly narrowing, but with more to do. The findings of the review will help us to work with government, employers and the profession to identify and understand the main contributors to the gap, and to explore ways to reduce it, based on our evidence.